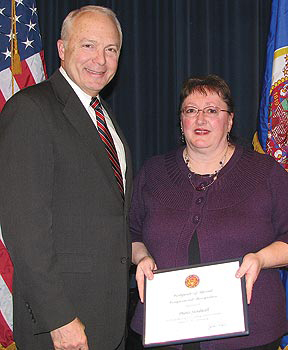 Congressman John Kline honored Faribault resident Diana Sundwall with a Congressional Certificate of Special Recognition at the "Star of the North"ceremony last week at the Lakeville Area Arts Center. "The Star of the North is designed to publicly recognize the extraordinary acts of service of Minnesotans in the Second District to our community and our world,"said Kline. "These random acts of kindness are among the many reasons we have earned the reputation of being 'Minnesota Nice.' "
After the loss of her own son 23 years ago, Sundwall founded "Infants Remembered in Silence,"an organization dedicated to supporting families who lose a child in infancy or during pregnancy. "In her gentle way, (Diana) helped both my husband and I through our darkest times and helped us accept our new reality,"said a woman who received support from the organization. Sundwall doesn't know who nominated her, she said Tuesday. "I specifically asked (Kline's staff), and they said they frequently read newspapers from the area"with information, Sundwall said, "but they also said several people were nominated this year." She received the letter informing her of the award in late January, but had to read through it a few times to realize what it was. "Then, to be honest, I put it on a pile, because I was busy getting ready for the (annual) IRIS Charity Weekend,"Sundwall said. Someone from Kline's office called her in February to remind her of the event. "It really was amazing what the other people had done,"she said of the recognition ceremony. "Many of the people there had saved lives." Sundwall was, she added, "pretty impressed by the kids. You don't expect them to do some of the things they did." "We are blessed in Minnesota to be surrounded by so many selfless individuals who are willing to step up to address the needs they see in our communities and beyond,"he said. "These 'Stars of the North' have given far more than they have received â€” volunteering, offering a helping hand, reaching out to a neighbor to ask, 'what can I do for you?' "
That's really what it's about, Sundwall said. "To us, a thank-you note from a parent is still tops, but this is pretty nice,"she said.